Prices listed are within the local area – Castleton, NY. Additional charges for travel and lodging apply. Rejuvenate your body, mind, and spirit at the Tipi Lodge, Pine Lodge or in the 16′ Tipi. See our Accommodations page for more information. Please contact me by phone 518-732-7440 or by email pinetree444@msn.com to book a service or session or for more information. I come to your home to Bless or Cleanse your space or land with special smudging herbs. I listen of what is needing to be Healed, some may need to be lifted up to clear the space. Every place is different. Cost: $120.00 plus traveling cost. Contact: Zelda by phone 518-732-7440 or e-mail to book an appointment. Are offered as needed to assist people in their spiritual journeys. I sit with you and Intuitively listen to your story as it unfolds (either in person or by phone). Through spirit guidance, this process helps gain clarity and move forward with better understanding. Where: Castleton, NY – Call 518-732-7440 or e-mail for directions. Sessions are offered at $120 an hour. Come See What The Bones Tell You. It’s a reading on where you are in your life’s Journey. By throwing the different animal bones, trinkets, shells, and coins in a circle it will show you the past and present. It also shows you where you are caught up in life. I will shed light on these moments to change your perspective in a positive way. In this 2-hour meditation class, we will come together as a community to heal ourselves and the Mother Earth through the vibrations of the Singing Bowls and the heartbeat of the Drum. We will use the Bowls and the Drum to learn to communicate with the Inner Child. The Sacred Sounds will break up our negative thought patterns, which were developed throughout our Life Journey. We’ll give ourselves permission to heal the inner child through Sounds, Toning, Chanting and Tapping our bodies where we feel the energies are stuck. We will create the possibility to heal the old feelings without experiencing the past traumas associated with them. 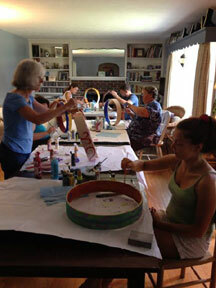 In this workshop, we will use the Bowls and the Drum to learn to communicate with the Inner Child. The Sacred Sounds will break up our negative thought patterns, which were developed throughout our Life Journeys. We’ll give ourselves permission to heal the inner child through Sounds, Toning, Chanting and Tapping our bodies where we feel the energies are stuck. We will create the possibility to heal the old feelings without experiencing the past traumas associated with them. 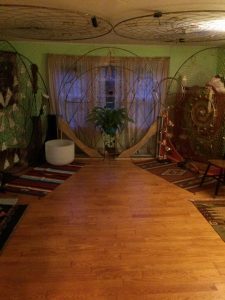 Your group will sit with the Sacred Dream Circles and I will lead a Guided Meditation. 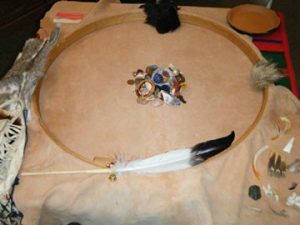 The Sacred Dream Circles and the thousands of crystals they contain have the capacity to touch all walks of life, all ethnic backgrounds, all religions, and all spiritualities. Come into their presence. Experience the spirit that brings joy and love within each of the Sacred Dream Circles which offer each of us access to healing through the energy of compassion and love. In this workshop, you will create a 16″ drum and Drum Stick from start to finish. You may choose from buffalo, elk, or deer skin. You paint your rim, then choose the skin for your drum head. You will learn to intuitively select the section of the skin to cut for it. Includes 16″ drum, drum stick, drum bag, and the process of your healing through the journey in birthing your Drum. Cost: $300 includes all materials and Lunch. A $100 deposit (non refundable) is required to save your space. A guided meditation uses sound vibration and the breath with crystal singing bowls, drums, and rainsticks. This encourages self healing by allowing the body to ground its energy, generating a state of peaceful bliss. I am available to provide Sacred music for various Ceremonies and events. I can bring my 14’ Tipi and share items I have made that demonstrate recycling fibers from the earth & craft making. Prices are not listed for special events as they are figured on an individual basis due to the many variables in location, travel expenses, number of participants, etc. I would be very happy to discuss your “special event” with you and to suggest an appropriate fee for activities, supplies, and services. We will create a Drumming Circle in your space. My intention is to hold the peace, love, and compassion for all creation and that this will be a heart-opening and playful experience for all. Please bring your drums and rattles. I will bring drums and rattles for you to use if you do not have any. 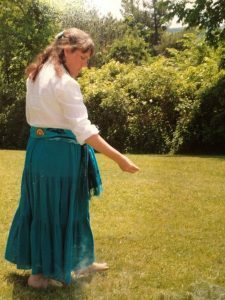 Working with vibration and sound, in this 2 1/2 hour class, I will share how to use drums, rattles and crystal singing bowls in a healing modality and detect where the energy is blocked. Through this class you will have the experience to bring in the visions and the healing. Through the art of storytelling we journey into life’s lessons, hopes and dreams opening our hearts to the innocence of love. Storytelling helps us to lessen the burdens of life with laughter, joy and surprise. In this 2-hour Smudge Class, I will talk about the properties of each plant, and their effect on the Body, Mind and Spirit. I will explain How and Why to combine them. We will Journey with each plant, to find its essence. The journeying will take you to the Spirit of each plant, where you will be able recognize the ones which call to you. You will build a relationship with the plants you are drawn to, and will be able to choose the proper ones for use in Blessing, Clearing and Prayer. You will take home a sample of each plant you connect with, and each of you will make your own small smudge pot.